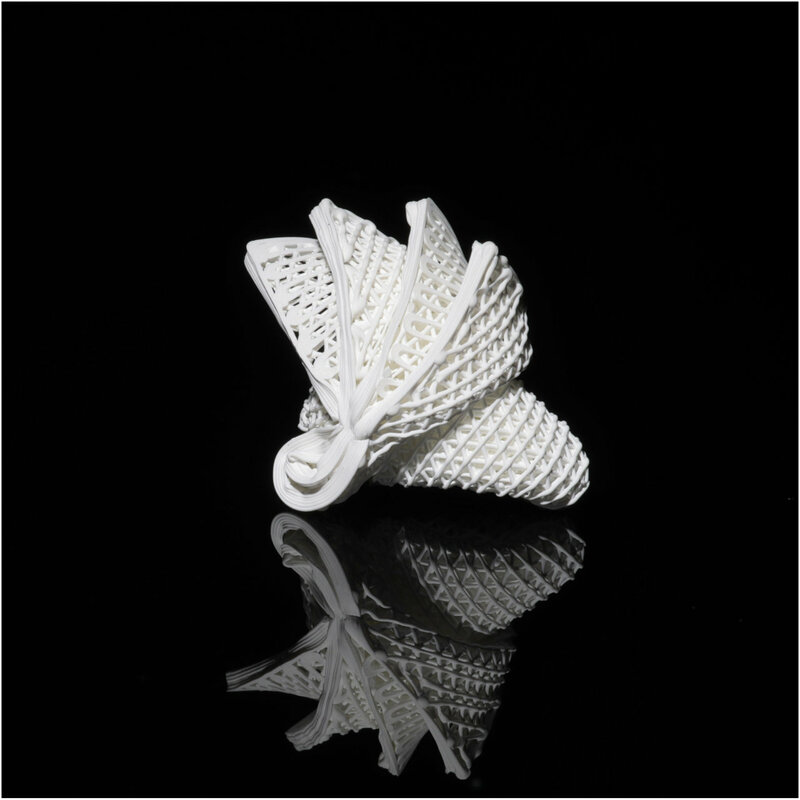 A research team at City University of Hong Kong (CityU) has achieved a groundbreaking advancement in materials research by successfully developing the world's first 4-D printing for ceramics, which are mechanically robust and can have complex shapes. This could turn a new page in the structural application of ceramics. Ceramic has a high melting point, so it is difficult to use conventional laser printing to make ceramics. 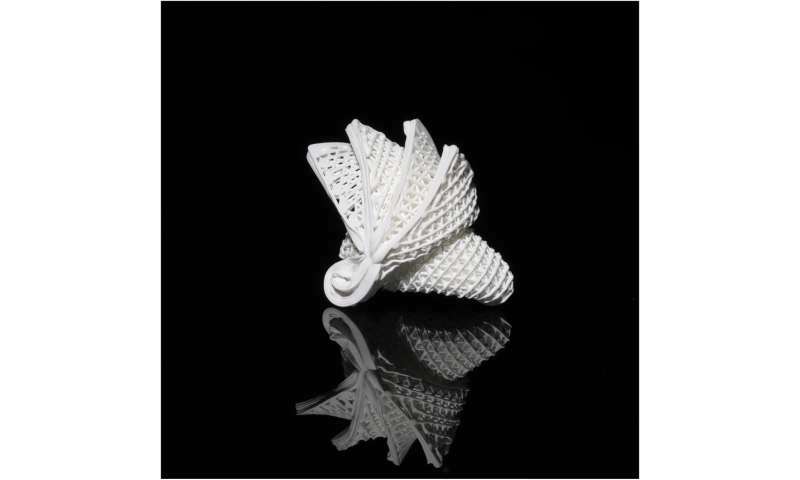 The existing 3-D-printed ceramic precursors, which are usually difficult to deform, also hinder the production of ceramics with complex shapes. To overcome these challenges, the CityU team has developed a novel "ceramic ink," which is a mixture of polymers and ceramic nanoparticles. The 3-D-printed ceramic precursors printed with this novel ink are soft and can be stretched three times beyond their initial length. 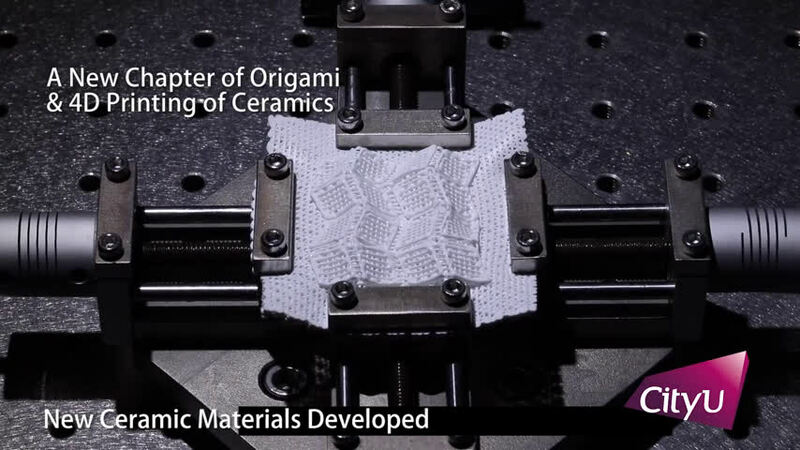 These flexible and stretchable ceramic precursors allow complex shapes, such as origami folding. With proper heat treatment, ceramics with complex shapes can be made. The team was led by Professor Lu Jian, chair professor of mechanical engineering, who is a distinguished materials scientist with research interests ranging from fabricating nanomaterials and advanced structural materials to the computational simulation of surface engineering. With the development of the elastic precursors, the research team has achieved one more breakthrough by developing two methods of 4-D printing of ceramics. 4-D printing is conventional 3-D printing combined with the additional element of time as the fourth dimension, where the printed objects can re-shape or self-assemble themselves over time with external stimuli, such as mechanical force, temperature, or a magnetic field. In this research, the team made use of the elastic energy stored in the stretched precursors for shape morphing. When the stretched ceramic precursors are released, they undergo self-reshaping. After heat treatment, the precursors turn into ceramics. It took more than two and a half years for the team to overcome the limitations of the existing materials and to develop the whole 4-D ceramic printing system. In the first shaping method, a 3-D-printed ceramic precursor and substrate were first printed with the novel ink. The substrate was stretched using a biaxial stretching device, and joints for connecting the precursor were printed on it. The precursor was then placed on the stretched substrate. With the computer-programmed control of time and the release of the stretched substrate, the materials morphed into the designed shape. 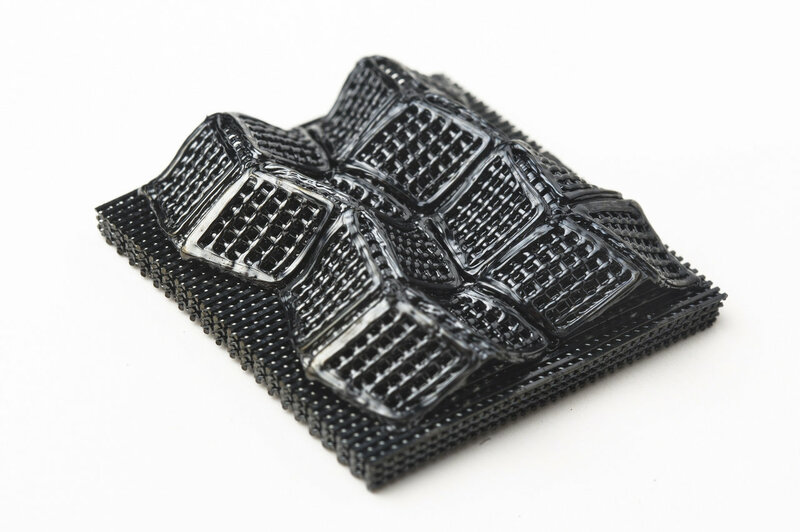 The innovation was published in the latest issue of top academic journal Science Advances under the title "Origami and 4-D printing of elastomer-derived ceramic structures." All research team members are from CityU, including Dr. Liu Guo, Research Assistant, Dr. Zhao Yan, senior research associate, and Dr. Wu Ge, research fellow. "With the versatile shape-morphing capability of the printed ceramic precursors, its application can be huge," said Professor Lu. One promising application is electronics. Ceramic materials have much better performance in transmitting electromagnetic signals than metallic materials. With the arrival of 5G networks, ceramic products will play a more important role in the manufacture of electronic products. The artistic nature of ceramics and their capability to form complex shapes also provide the potential for consumers to create custom ceramic mobile phone back plates. Furthermore, this innovation can be applied in aeronautics and space exploration. 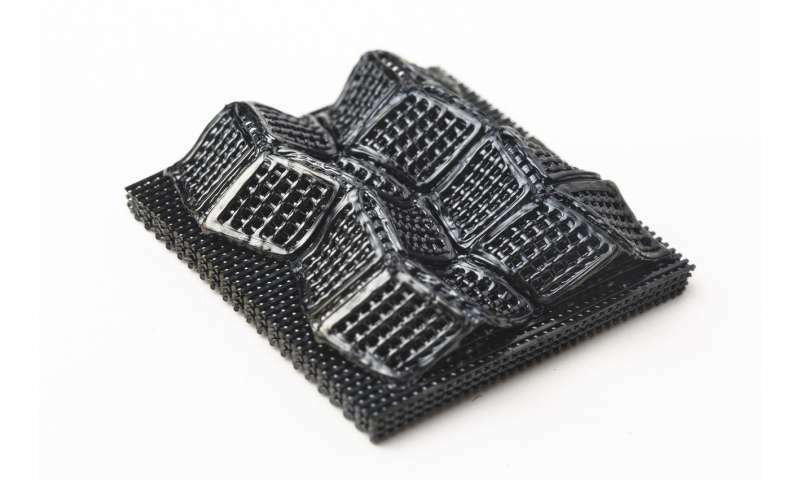 "Since ceramic is a mechanically robust material that can tolerate high temperatures, the 4-D-printed ceramic has high potential to be used as a propulsion component in the aerospace field," said Prof Lu. Riding on the breakthrough in material and 4-D-printing technique advancement, Prof Lu said the next step is to enhance the mechanical properties of the material, such as reducing its brittleness.